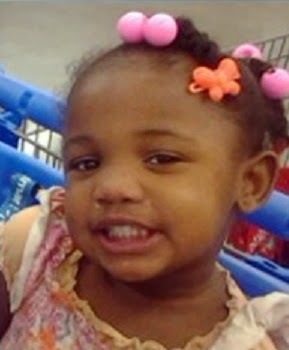 Police in Madison County, Mississippi, are desperately looking for a two-year-old girl who went missing from her family home on Saturday, March 1, 2014. Myra Lewis was last seen by her mother at about 11 AM on Saturday, as she was leaving to go to the grocery store. According to police, Myra’s mother told Myra and her sisters to go inside the house and then she pulled away. Myra’s father was inside the home taking care of a newborn baby. He said he noticed that Myra was missing around noon, but the other kids told him that she had left with her mother. When the mother came home from the grocery store at 3 PM, they realized Myra was missing. The family searched throughout the house and in the neighborhood before calling the police at 4 PM. Madison County Sheriff Randy Tucker told reporters that the search for Myra is ongoing and that the FBI has now joined the search. “Until we can prove or disprove one or the other, we’ve still got to consider every possibility. She may have wandered off or been abducted, we just don’t know what (happened) at this point,” He said. Myra’s parents say they believe she was abducted. Myra was last seen wearing a turquoise sweater with a bear on the front, off-white or khaki pants and pink shoes. She is 34 inches tall, weighing 27 pounds. Please call the FBI at (601)948-5000 if you have any info. Myra’s mother has been arrested on unrelated charges and was taken into custody on Friday night. The Sheriff’s Department confirmed with reporters that the arrest stemmed from her carrying a concealed weapon while being a felon. It’s unclear what her prior arrests were for. Also on Friday, authorities closed off the road leading to the Lewis home, and searched the property with K9s and heavy digging equipment. Police say Myra’s parents have been cooperating with the investigation and they have not been named as suspects in her disappearance. According to reports, police dogs were able to track Myra’s scent up to the road. The FBI is offering a $20,000 reward for Myra’s return.